Measurement of air-entrainment in complex flow structures such as hydraulic jumps, stepped spillways, etc. 2008-2012: (PI) PTDC/AAC-AMB/101197/2008 - Experimental validation of the theoretical Multiple-Linking-Element (linkage-model) for improving integrated sewer/surface Urban Flood Models. 2008-2013: PTDC/ECM/105446/2008 - Experimental and Numerical set-up for validation of the Dual-Drainage (sewer/surface) concept in an Urban Flooding framework. 2010- 2016: SFRH/PROTEC/67486/2010: "Avanços na Modelação Numérica de Escoamentos em Meios Urbanos". 2011- 2015: SFRH/BD/81869/2011 “Development of a State of the Art Urban Flood Model (UFM)". 2012 -2016: SFRH/BD/85783/2012 "Numerical and experimental study of the free surface behaviour of flood control devices under turbulent conditions". 2013-2014: (PI) "Dual Drainage, DFG – Initiation of International Collaboration: Guest Visit/ Trip Abroad Proposal". 2014-2017: FP7-PEOPLE-2013-ITN-: "QUICS"- Quantifying Uncertainty in Integrated Catchment Studies”, PI Dr. Alma Schellart from the University of Bradford. 2014-2017: EPSRC: EP/K040405/1, PI “Experimental and Numerical Investigation of Flow Exchange in Urban Flood Flows”, PI Dr. James Shucksmith from the University of Sheffield. 1) Leandro, J., Chen, A. S., Djordjevic, S. and Dragan, S. (2009)" A comparison of 1D/1D and 1D/2D coupled hydraulic models for urban flood simulation" J. of Hydraul. Eng-ASCE, 135, 6 (1), 495-504. 2) Dawson RJ, Speight L, Hall JW, Djordjevic S, Savic DA, Leandro J. (2008) Attribution of flood risk in urban areas. Journal of Hydroinformatics-IWA;10(4):275-88. 3) Chen, A., Djordjevic, S., Leandro, J. and Savic, D. (2010). "A study for analyzing the composite consequences of pluvial and fluvial flooding." Water Sci Technol - IWA, 62 (7), 1491-1498. 4) Leandro, J., Djordjević, S., Chen, A. S., Savić, D. A., and Stanić, M. (2011). "Calibration of a 1D/1D urban flood model using 1D/2D model results in the absence of field data." Water Sci Technol, 64 (5) 1016–1024. 5) Carvalho, R., Leandro, J. (2011) "Hydraulic characteristics of a drop square manhole with a downstream control gate" Journal of Irrigation and Drainage Engineering-ASCE. 6) Isidoro, J., de Lima, J., Leandro J. (2012) "Influence of wind-driven rain on the rainfall-runoff process for urban areas: Scale model of high-rise buildings" Urban Water Journal-Taylor&Francis, 9 (3), 199-210. 7) Isidoro, J., de Lima, J., Leandro J. (2012) "The study of rooftop connectivity on the rainfall-runoff process by means of a rainfall simulator and a physical model" Zeitschrift für Geomorphologie, 57 (1), 177-191. 8) Leandro, J., Carvalho, R., Chachereau, Y., and Chanson, H. (2012) „Estimating void fraction in a hydraulic jump by measurements of pixel intensity“ Experiments in Fluids, 55 (5), 1307-1318. 9) Leandro, J., J. P. Leitão and J. L. M. P. de Lima (2013), “Quantifying the uncertainty in the SCS flood hydrographs: a case study in the Azores islands.” Journal of Flood Risk Management, 6 (3), 279-288. (JFRM Outstanding Paper Award supported by The JBA Trust – commended paper). 10) Romagnoli, M., Carvalho, R., and Leandro, J. (2013). ”Turbulence Characterization in a Gully with Reverse Flow.” J. Hydraul. Eng., 139(7), 736–744. 11) Carvalho, R. and Leandro, J. (2013). ”Closure to “Hydraulic Characteristics of a Drop Square Manhole with a Downstream Control Gate” by Rita F. Carvalho and Jorge Leandro.” J. Irrig. Drain Eng., 139(7), 594–595. 12) Lopes, P., Leandro, J., Carvalho, R.F., Páscoa, P., and Martins, R., (2013). Numerical and experimental investigation of a gully under surcharge conditions. Urban Water Journal, 12 (6), 468-476. 13) Martins, R., Leandro, J., and Carvalho, R. dF. De. (2014). Characterization of the hydraulic performance of a gully under drainage conditions. Water Sci Technol. [paper accepted for publication on 14/03/2014]. 14) Leandro, J., Bung, D., and Carvalho, R.F. (2014).Measuring Void Fraction And Velocity Fields Of A Stepped Spillway For Skimming Flow Using Non-Intrusive Methods. Experiments in Fluids-Springer. 55, 1732. 15) Leandro, J., Lopes, P., Carvalho, R., Páscoa, P., Martins, R., and Romagnoli, M. (2014). Numerical and experimental characterization of the 2D vertical average-velocity plane at the centre-profile and qualitative air entrainment inside a gully for drainage and reverse flow. Computers and Fluids-Elsevier, 102(10),52-61. 16) Melo, N, Santos, B., and Leandro, J. (2014). A Prototype Tool for Dynamic Pluvial-Flood Emergency Planning. Urban Water Journal-Taylor & Francis, 12 (1), 79-88. 17) Leandro, J. (2014). Title of Special Issue: Towards more Flood Resilient Cities. Urban Water Journal (Editorial), 12 (1), 1-2. 18) Leandro, J., Chen, A.S., Schumann, A., (2014). A 2D parallel diffusive wave model for floodplain inundation with variable time step (P-DWave). J. Hydrol. - Elsevier, 517, 250–259. 19) Chen, A., Leandro, J., Djordjevic, S. (2015). Modelling sewer discharge via displacement of manhole covers during flood events using 1D/2D SIPSON/P-DWave dual drainage simulations. Urban Water Journal (online). 20) Martins R., Leandro J. and Djordjević S. (2015) A well balanced Roe scheme for the local inertial equations with an unstructured mesh, Advances in Water Resources, 83, 351-363. 21) Martins R., Leandro J. and Djordjević S. (2016) Analytical solution of the classical Dam-break problem for the Gravity Wave Model equations, J. of Hydraul. Eng., ASCE. 22) Martins R., Leandro J. and Djordjević S. (2016) Analytical and numerical solutions of the Local Inertial Equations, International Journal of Non-Linear Mechanics, Elsevier, 81(5), 222-229. 23) Leandro, J., Schumann, A., and Pfister, A. (2016). A step towards considering the spatial heterogeneity of urban key features in urban hydrology flood modelling. J. Hydrol., Elsevier, 535 (4), 356-365. 24) Lopes, P, Leandro, J., Carvalho, R., Russo, B., and Gómez, M. (Accepted) Assessment of a VOF Model Ability to Reproduce the Efficiency of a Continuous Transverse Gully with Grate, J. Irrig. Drain Eng.-ASCE. 25) Lopes, P, Tabor, G.Carvalho, R.Leandro, J. (2016), Explicit calculation of natural aeration using a Volume-of-Fluid model. Applied Mathematical Modelling, (online). 26) Martins R., Leandro J. and Djordjević S. (Accepted) Influence of sewer network models on urban flood damage assessment based on coupled 1D/2D models, Journal of Flood Risk Management, (online). 27) Leandro J. and Martins R., (Accepted) A Methodology for Linking 2D Overland Flow Models with the Storm Sewer Model SWMM 5.1 Based on Dynamic Link Libraries., Water Science and Technology, IWA. 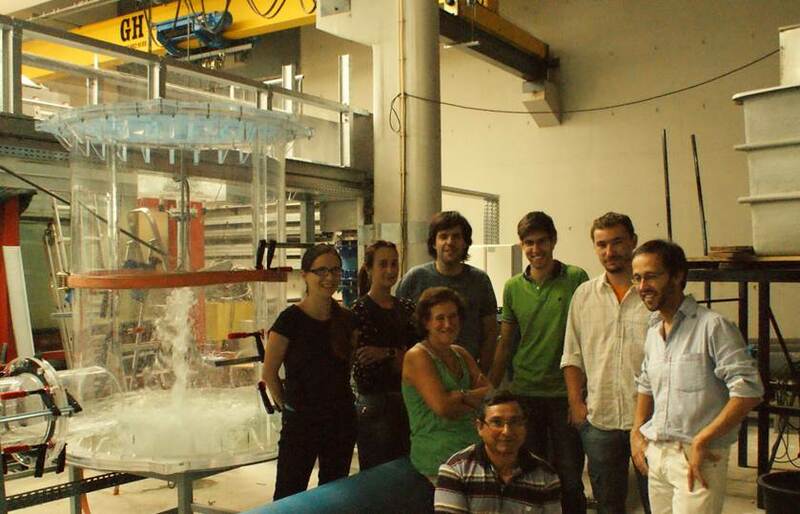 At the University of Coimbra Laboratory with Patricia Páscoa, Raquel Quinteiro, João Abrantes, Pedro Lopes, Ricardo Martins, Rita Carvalho and Joaquim Cordeiro, taken on the 18-7-2012. 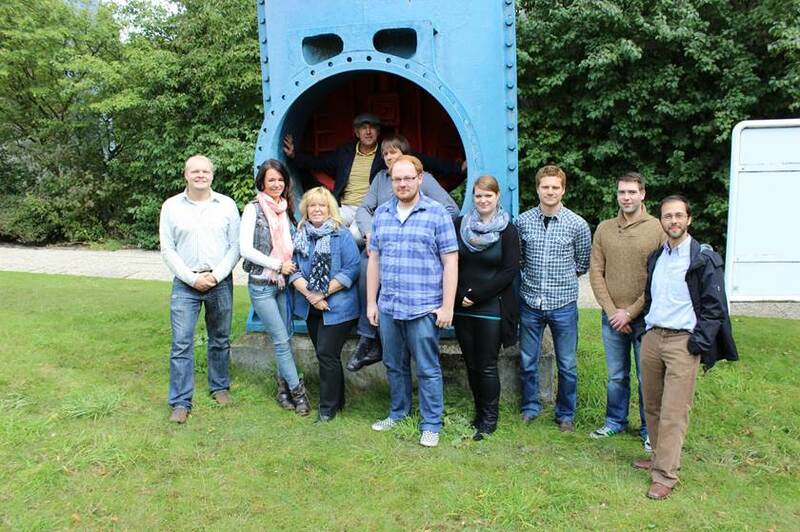 At the RUHR University of Bochum with colleagues from the Hydrology, Water Resources Management and Environmental Engineering Institute, taken on the 18-9-2013.